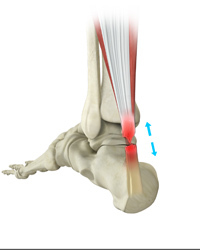 Achilles tendon rupture generally occurs with sudden forceful push-off and commonly during sports. It results in complete tearing of the tendon with some retraction of the tendon ends. Optimal treatment for this common injury has been extensively studied, yet it still remains somewhat controversial. What we do know, is that with appropriate treatment the tendon will heal without or with surgery. The main benefit of surgery is a reduced risk of re-rupture and probably greater push-off strength. Most athletically active patients choose to have surgical repair. Achilles tendon problems at the back of the heel (insertion) are usually degenerative in nature and result in pain and a bony prominence. The medical term is ‘insertional achilles tendinopathy’. The first line therapy includes physiotherapy, accommodative footwear (heel raise, soft counter) and judicious use of anti-inflammatory medication and corticosteroid injections. If non-operative treatment fails, surgery can be helpful. The most commonly used procedure is debridement of the tendon, resection of the prominent bone and repair of the tendon. Ankle arthritis is degeneration and eventual loss of the cartilage lining of the ankle joint. It leads to pain, swelling and stiffness (restricted movement) of the joint. It is commonly due to cartilage injury (trauma), but it can have other causes. Initial treatment is aimed at lessening the symptoms with conservative treatments. If these measures fail to control your symptoms, surgery is indicated. 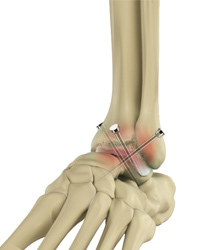 Ankle arthrodesis is an effective way to control the pain due to ankle arthritis. It does eliminate movement in the ankle joint, but other joints around the ankle compensate and allow up to 30% of pre-existing ‘up-down’ and ‘side-side’ motion. Most patients walk with a minimal or imperceptible limp. Pain, swelling and stiffness at the base of the big toe is frequently caused by osteoarthritis of the 1st (big toe) metatarso-phalangeal joint. It results in pain, spurs and progressive restriction of movement. The cause is unfortunately unknown in most cases. The treatment is aimed at relieving pain. If non-operative means such as anti-inflammatories, accommodative footwear or orthoses fail to control symptoms surgery may be indicated. 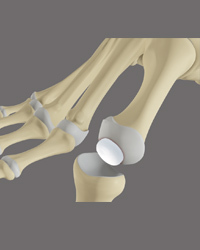 Synthetic interposition arthroplasty is a joint movement preserving option for managing big toe osteoarthritis. 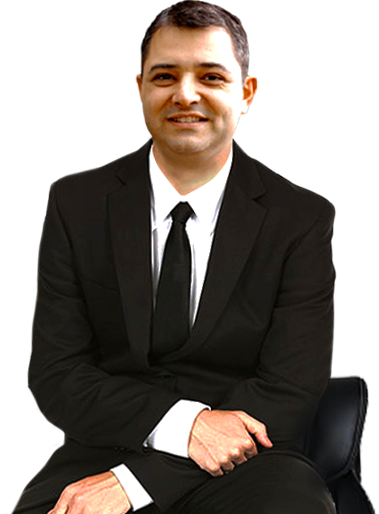 It is a relatively new procedure however it has promising medium-term results in clinical studies. Metatarsalgia is a term used to describe pain under the ball of the foot. It can be caused by overload of the metatarsal heads, and this can often be associated with a callosity under the ball of the foot. 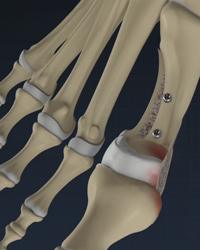 It can often be associated with a plantar plate tear, metatarsophalangeal instability and hammer-toe deformity. The conservative treatment of primary metatarsalgia includes offloading with orthoses (metatarsal bar or dome), regular shaving of the callus and appropriate footwear. If all conservative measures fail, surgery can be an option. 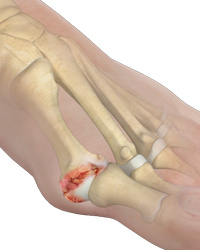 Subtalar joint arthritis is degeneration and eventual loss of the cartilage lining of the ankle joint. It leads to pain, swelling and stiffness (restricted movement) of the joint. 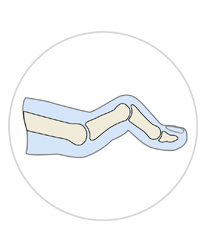 It is commonly due to injury (such as calcaneal fracture), but it can have other causes. Initial treatment is aimed at lessening the symptoms with conservative treatments. If these measures fail to control your symptoms, surgery is indicated. 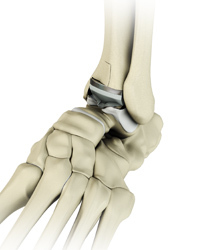 Ankle arthrodesis is an effective way to control the pain, but it does eliminate movement in the subtalar joint. Most patients do not have a limp, but getting used to the stiffened hindfoot can take some time, especially walking on uneven surfaces. Ankle arthritis is degeneration and eventual loss of the cartilage lining of the ankle joint. It leads to pain, swelling and stiffness (restricted movement) of the joint. It is commonly due to cartilage injury (trauma), but it can have other causes. Initial treatment is aimed at lessening the symptoms with activity modification (low impact), weight loss and even walking aids. Judicious use of anti-inflammatory medications, analgesics and orthoses can also be helpful. If these measures fail to control your symptoms, surgery is indicated. 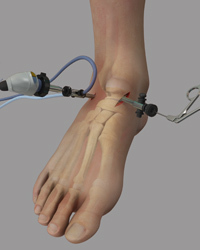 Ankle replacement is an effective way to control the pain due to ankle arthritis. 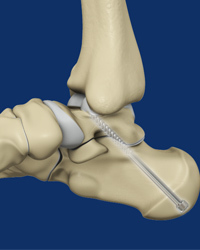 It is an established procedure which is an alternative to an ankle fusion. 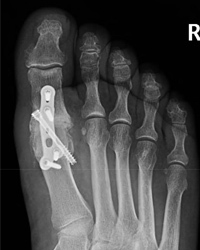 It is not necessarily better for every patient and it does carry a higher risk of re-operation compared to ankle fusion.